Property Assessed Clean Energy (PACE) allows property owners to finance energy efficiency, renewable energy and water conservation upgrades to buildings that help reduce energy usage and costs. PACE can pay for lighting and control upgrades, new heating and cooling systems, motor improvements, compressed air system improvements, solar panels and more. PACE financing provides up to 100 percent of a project's costs and is repaid for up to 20 years with an assessment added to the property's tax bill. PACE financing is tied to the property, not the owner, and is easy to share with tenants. 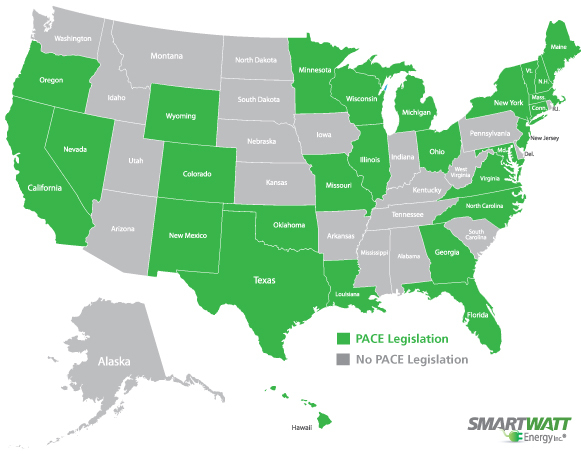 PACE financing is currently available in 27 states. SmartWatt Energy's turnkey integrated energy-efficiency solutions include facilitation of PACE financing. A SmartWatt Project Engineer will conduct a detailed energy analysis of your building(s) for potential efficiency measures and deliver project costs, savings and other information required to receive PACE financing.